Known internationally for his large murals and stencil work, Stinkfish commonly refers to photographs of local people that he takes in passing and later turns into stencils. This is the first ever multi-method print on 1xRUN, and perfectly fitting for an artist like Stinkfish. In producing these, they have created a set of giclee prints of an old magazine cover Stinkfish found, to use as a base. 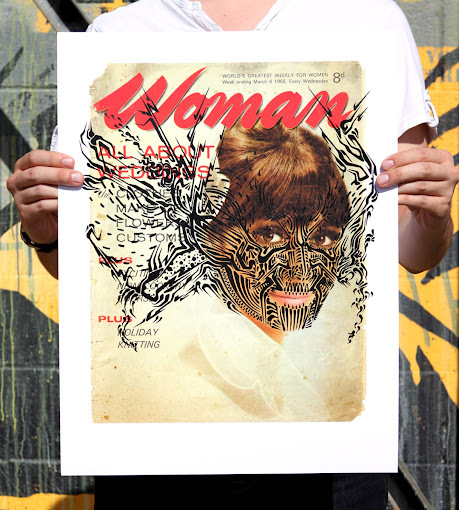 Afterwards, his stencil design was screen printed on top of the giclee with a thick layer of special black, glossy ink. The high quality image looks truly vintage, and silkscreen effect of the mask stands well above the image, just as the stencils he is known for. 1xRUN are simultaneously releasing two color versions of this print. A total of 50 in black, and 20 in pink. All prints are Signed & Numbered by the Artist and come with a Certificate of Authenticity from 1xRUN and go on sale on Monday the 5th of September.